Another interview with Tamara Moskvina dedicated to her 75th anniversary. Many colleagues can be envy of your life energy. Where do you get strength? Tamara: At any age, it’s important not to be depressed. We must live not looking around and to each case came with creative. You can’t turn the work into a mechanical process, it’s a sure path to oblivion. You also have a creative approach to celebration of anniversaries. Five years ago, you celebrated on the Palace Square, where several thousand of roller skaters set off on the Nevsky Prospect. In 2006 sang songs of Alexandra Pakhmutova to the accompaniment of a symphony orchestra. How did you celebrated this time? Tamara: We tried to make the event interesting for people. Celebrations joined several events. The date of beginning of the War, the 120th anniversary of the State University of Physical Culture Lesgaft that I graduated with a gold medal, and my modest anniversary. They organized partisan units like during the war. I also participated, become a “real partisan.” And the first congratulations I’ve started to receive in four o’clock in the morning. Exactly, at the time I was born 75 years ago. Everything in your life you try to do creatively, including ice. 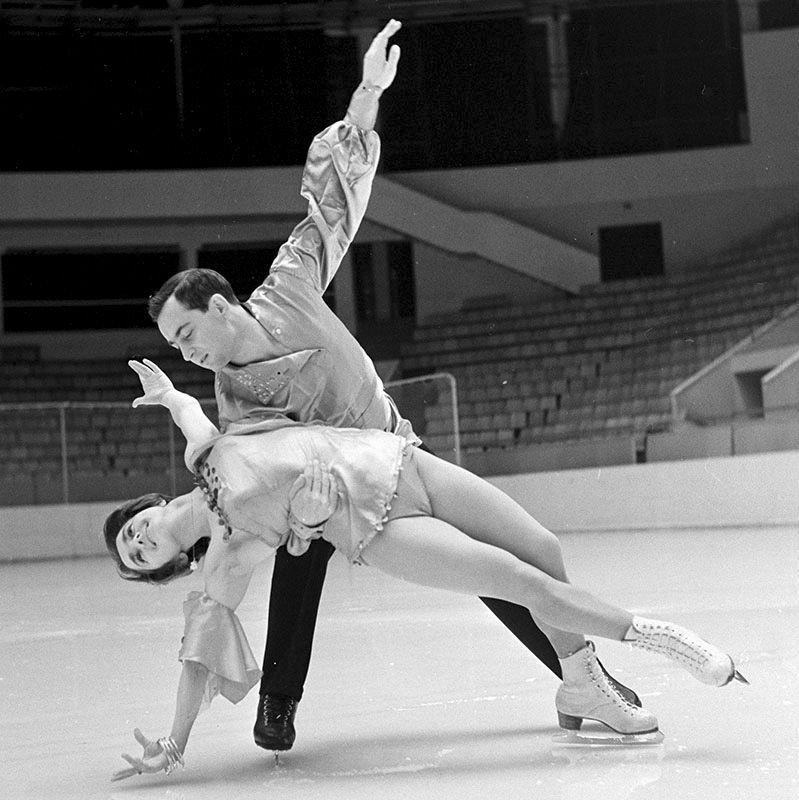 Your gala program at the 1965 European Championships in Moscow many called a fresh breath in figure skating. Tamara: Thanks that you remember. Gala it’s a special genre. Thanks to it, you have an opportunity to demonstrate unusual and memorable programs and thus entertain the viewer, to show all the colors of our sport. A career in single skating was evolving quite well, what prompted you to switch to pairs? Tamara: Very pragmatic reasons. By that time I had won National title five times in a row, but the Federation did not send me to the World Championship and very rarely gave me a permission to perform at the European level. There was no conflict between us, they just prefered to bet on the young. And no matter that at the international arena they were among outsiders. But the decisive role played a more powerful argument: pair skating allowed to pay more attention to the family. Tamara: None. My husband Igor Moskvin and I carefully analyzed and concluded that in the pair skating trainings took a little less time. In addition, in the 60th we had a strong traditions in pair skating. Everything turned out perfectly. I even managed to finish the thesis, that would have been unlikely possible, if I had stayed in singles. Tamara: I acted quite consciously. I decided that it was time to finish. In fact, I’ve become a coach already during my sporting career. Young skaters often gathered around me and asked for advice. I tried not to refuse anyone, explained in details the secrets of the work, and then watched with interest how they use the recommendations on practice. So coaching gene appeared not by chance, I was preparing myself to a new profession during a time of active competing. I have always been attentive to the requirements of teachers. First, Ivan Bogoyavlenskii and then my husband. The first instilled a love of figure skating, the second showed how to share knowledges with young people properly. Therefore, I became a coach largely due to my husband. Figure skating is one of those disciplines that, except one case, remained aloof from the doping scandals. But around the island of calm there’s a raging sea. The Russians are under threat of exclusion from the Olympic Games in Rio. Tamara: I do not know all the details. The story is very unpleasant. I can only draw conclusions on the basis of information published in the media. doping problem arose not yesterday, and it concerns many sports, because there is no smoke without fire. An anti-doping system imperfect itself, which need to be reformed. If we talk specifically about athletics, in this case is appropriate a phrase – fish rotting from the head. Presidents of international and Russian Athletics Federations – just a weak persons If they made such a mess in their organizations. Don’t you think that the national sport is under a deliberate attack? Tamara: I can answer for figure skating. Since Soviet times, we have been facing with unobjective judging and a number of other interfering factors. But in spite of all obstacles, we have been winning, both then and now.